Este no es el historial de versiones (o registro de cambios) oficial. Para ver la lista oficial, visita la web de Mojang. Para ver versiones previas a la beta 1.8, visita el blog de Notch, llamado Word of Notch (la palabra de Notch). Este artículo trata sobre las actualizaciones de la versión Beta para ordenador. Para otras fases de desarrollo, véase Historial de versiones (desambiguación). Para versiones en desarrollo, véase Historial de versiones/En desarrollo. Para actualizaciones futuras, véase Historial de versiones/Futuras características. Una interrogación (?) indica que la información de la actualización no es segura y, tal vez, puede ser incorrecta. La fase de desarrollo beta comenzó el 20 de diciembre de 2010 y acabó el 18 de noviembre de 2011. Fue precedido por Alfa y continuado por el lanzamiento oficial de Minecraft. Aviso: Minecraft 1.9 es un término que se utiliza para describir el contenido de Minecraft que salió entre 1.8 y la versión completa de Minecraft 1.0 el 18 de Noviembre de 2011. La "actualización del sonido" 3 de noviembre de 2011 Esta actualización trajo cambios adicionales y de sonidos dentro de la carpeta /.minecraft/resources; El cliente no se actualizó. ⇧ Shift+ clic en un Cofre/Inventario crashea el juego fijado. ⇧ Shift+ clic en los items dentro y fuera de un dispensador crashea el juego fijado. Las semillas de calabaza ya no generan en los cofres de Minas Abandonadas. As a placeholder, Endermen used Zombie sounds. New features in the terrain generator. New, fractal-based biome code; added and removed some biomes while making all of them more vast than before. Rivers flowing through/in between biomes. Ocean Biomes, that are deeper and much more vast than before. snow in Taiga and Tundra biomes do not generate for technical reasons. They return in Beta 1.9. New ocean floor; random mix of sand, dirt, and clay. Because of this, clay is much more common. Hostile mobs perform attack animations. There is now a food meter. Food no longer heals directly but indirectly: if the food meter is above 90%, heals about every 5 seconds. All food (except Mushroom Stew) are now stackable. Food takes 1.6 seconds to consume, accompanied with an animation. Steak, which has Cooked Porkchop's old texture. Cooked Porkchops' new texture is a tan shade of the same sprite. Eating any raw food or Rotten Flesh has a chance to give the player food poisoning which makes the Hunger bar decrease three times as fast. New seeds for farming: pumpkin seeds and melon seeds that produce Pumpkins and Melons respectively. A new achievement: "Kill a skeleton with an arrow at 50 meters". Passive mobs will randomly flee if attacked by the player or other mobs (such as Wolves). Skeletons now hold full-size bows. Player-to-mob damage decreased by half a heart. Arrows that hit a mob visually "stick" into the mob rather than just disappear. Skeleton arrows originate from about their eyes to the bow, instead of above the head. Non-sky based light now gives a very subtle 'flicker'. The Main Menu's background is now an animated scene. "Attack", "Use Item", and "Pick Block" can now be remapped. Player list in SMP, defaults to Tab ↹. The 'Multiplayer join screen' has been improved, mainly with a server list. New texture for Moss Stone to match Cobblestone's. Clouds change color during sunrise and sunset to match the sky color. Horizon, specifically haze changes color more vividly during sunset and sunrise. Performing a critical hit on any mob will cause 'sparks' to fly. Explosion particles are now shockwaves instead of smoke. Tiny stationary bubble particles can be seen when underwater. Fog is now thicker and darker deep underground, and gives off particles. Due to this, the void appears black. The world's numeric seed is displayed in a field below player position. Changing fog by hotkey now requires debug-view to be open in addition with pressing F.
⇧ Shift+Clicking the output item in a crafting square will craft all the items at once, and automatically places them in the inventory. The version tag appears in-game again. Armor bar moved to above hearts, due to food bar. Improved chest model with a 3D lock. Players with the OP position on a server can switch back and forth between survival and creative mode. The game's coding now allows for mods to more easily change the(map) height. Holding the left mouse button with a weapon will now only swing once. Holding the right mouse button to place blocks is slightly slower than before. The ⇧ Shift+Click crash bug from 1.8pre2 is fixed. Fixed Redstone circuits not working after /time set x glitch is now fixed in SMP. Destroying boats and minecarts now creates particles. Ghast attack sounds are fixed in SMP. The Far Lands had been removed; there is now only void. There is a memory leak mainly occurring on Linux 32 bit. The destruction animation for chests is missing. Lighting persists in water even after the light source is removed. Experience orbs when dropped don't drop in a stack like items do, so when a player dies when they have a large number of experience, each orb has to be processed individually. This will cause a high amount of lag, especially for SMP servers. Double chests placed before 1.8 on multiplayer servers all appear to players to be facing the same direction, even when they should be rotated by 90 degrees. The Item Selection screen in the new Creative game mode is missing pine and birch leaves, tall grass, double slabs, monster spawner, snow cover, and both huge mushroom blocks. Even though the Far Lands had been corrected, fake chunks still generate (but now generates at X/Z 30,000,000). Also, most of the effects of the Far Lands still exist, although terrain still generates correctly. When you sleep,the day/night cycle does not advance but only spawns a hostile mob. Corrected a block duplication bug when using pistons. Corrected a redstone torch duplication bug when using pistons. Corrected a client crash when placing a sign in front of the piston, powering the piston and then removing the block beneath the sign. Ice blocks are now pushed without causing water streams breaking everything. Powered Rails are no longer being powered magically without a power source. Pistons connected to the end of a piston transistor via redstone are now properly closed when the power goes out. Doors no longer create purple particles. Hacking clients can no longer edit texts of placed signs in multiplayer. Changed so that paintings pushed by pistons will pop off. When two lines of pistons push sand blocks against each other, a duplication bug occurs. Crashed worlds now work again. Pistons that caused crashing for multiplayer servers fixed. Fixed piston bug. Blocks that used to make the game crash in 1.7 now just get removed by the piston. Fixed right clicking on a sheep empty-handed causing game to crash. Worlds crashed are now loadable again. If a piston is activated and it disrupts a redstone wire, torch, repeater, pressure plate or any other block providing power and doing so will cut power to the piston in the same tick, the game will crash and become unloadable. Using any map editor to remove the offending blocks and entities will make the map loadable again. When crushed by pistons (or what they're moving) or when inside while it contracts, the player will be moved out of the way or into impossible places, on SMP this usually throws a "User moved wrongly!" warning. In rare cases, when redstone travels semi-long distances (almost 15 blocks), the current won't go through all the redstone, even with a repeater just before the end of the signal. Whether this is due to redstone errors or inter-block interaction errors, it is unknown. The door duplication bug is back again, this time happening when a piston pushes on the lower half of a door. If it is a normal piston that does it, then the piston can be destroyed and the bottom half of the door works like a normal door. Redstone wire now will connect to a repeater. Shears can be used to pick up leaf blocks. Shears can be used to shear sheep without hurting them. Sheep no longer drop wool from being punched, only from being killed or when they are sheared. New textures for Cobblestone and Brick blocks. Silverfish skin was added (for Beta 1.8). Cobweb now requires shears or a sword to be broken properly, and drops 1 string when destroyed. Pushing leaves, water, lava, levers, tall grass, flowers, mushrooms, saplings, dead shrubs and sugar canes with a piston causes the game to crash. In SMP the server crashes and restarting it doesn't necessarily fix the problem. Right clicking sheep while holding nothing causes the game to crash. When placing a block, it may be placed invisible, with only its border showing up. The same may happen when removing block, only its ghost will stay. Both these bugs result in crash. Bonemeal can grow tall grass and flowers on grass blocks. Added Performance in Video Settings, Options Menu. Can be set to Max FPS, Balanced or Power saver. Changed the material of Glowstone from "glass" to "stone". This means you need a pickaxe to get resources from it. This also means you can now place redstone, torches, levers, etc. on them. Made Glowstone drop more loot (2-4 Glowstone Dust). Made the recipe sizes for creating Wool and Glowstone smaller (2x2 instead of 3x3). The Minecraft: Xbox 360 Edition started from this version's features. Fixed beds not working very well in SMP. Destroying a Boat will no longer spawn the player too low, causing them to sometimes fall through the ground. Boats float up to the surface quicker. Boats falling down into water lose their vertical momentum much faster. ⇧ Shift+clicking a tool into a chest no longer restores it to new. When pillaring, it is possible to get stuck and repeatedly go into the block below you. If you disconnect and come back, you will be on the block above your head. If you are in the nether and way up near the top, you will skip to on top of bedrock. When you disconnect (SMP) at the bottom of a very high wall and reconnect to the server, sometimes your y position have been increased so you are in the air beside the wall, but you don't fall. Setting the new server option view-distance lower than 10 reduces the spawn rate significantly. Arrows fired by skeletons originate from above their model. Framerate cap can now be changed, with toggles of 40 FPS, 90 FPS and 200 FPS. Except for the 40 FPS setting, the framerate will only be capped when there are any chunk updates. ⇧ Shift+clicking an item in the crafting window now only moves the crafted item into the player's inventory. Version number no longer displayed while playing. Still visible on title screen and debug screen. Players riding anything or sleeping in anything will stop doing so when they leave the game now. Sneaking effect got decreased. The character's feet looks like it's in the air. It is now possible to climb stairs and slabs while sneaking. Player indicator on maps now points in the same direction as the player, instead of being rotated slightly. Dropped equipment no longer breaks on the first use. (In some cases it still will). Objects will now be pushed out if they are within a block. Lighting acts normal again when placing/removing torches. The game no longer crashes when shift-clicking to put items in a chest that is already full and vice versa. Fixed CPU issue on multiplayer. Saving while crouching no longer consistently teleports the player into blocks above or below when loading the save. Exiting a Minecart or moving from one Minecart to another will no longer bump the original Minecart and make it move. Fixed the players health appearing to be full when entering/exiting the nether. Fixed some entities appearing to fall through the ground repeatedly in multiplayer (some might still do so). Fixed the server sometimes thinking the player hit a corner when walking when they didn’t. Fixed the achievements window rendering some graphics outside the clip window. Fixed a couple of instances where beds would act strange in multiplayer, primarily the "already occupied" bug. On some computers, every few seconds, there is a huge drop in FPS lasting only a fraction of a second. This bug was noticed in version 1.6.5. Memory leaks. When a chunk unloads, its block textures and data are still present in the client's RAM, even if you cannot see the chunk anymore. Sometimes blocks will fail to render, creating massive holes on the ground and walls, allowing the player to see caves and dungeons under the map. This probably happens when Minecraft runs out of memory. Setting Framerate Limit to 40 FPS may increase CPU usage on some computers. When Dead Shrub (Type of tall grass) (Not Desert Dead Shrubs) are broken, their particles are gray (no hue). Difficulty may revert to "Easy" when you load a save, at least when you had it previously on "Peaceful." Respawn after death results in being stuck until breaking block below. Does not occur at all spawn points. Beds have numerous issues in SMP; players may sleep during night, but nothing will happen as the game thinks you're trying to sleep. This allows the player to sleep and walk freely at the same time. When all players are asleep, a few seconds later the game teleports you back to the bed and the normal post-sleeping effect will occur. Setting view-distance=7 (or lower) in server.properties causes part of the maps (item) to revert. In SMP, sometimes when entering the World from the Nether, the sky will remain red. Minecarts stopped on E/W powered rail will not bounce off one another, but they will on N/S powered rail. 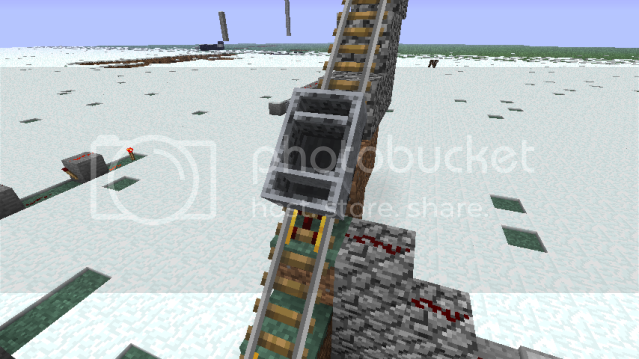 On unlit powered rail as part of a track which terminates at a solid block to the North or to the East, a minecart can be shoved off of the track directly into the block, by a player or by another minecart. If you ⇧ Shift+click an item into a full chest, the client will not crash, but the server does. Sometimes when trying to lie down on a bed, it fails and removes one half of a heart in SMP. Shadows sometimes do not update. Shift-clicking to receive items from crafting doesn't count towards items crafted in your statistics. Walking in a corner in certain circumstances results in falling in the next block (tested on leaves). You cannot place redstone on TNT anymore. Left clicking on a series of Doors/Trap Doors will open all within range of your punch instead of the first. Clay is almost nonexistent in newly generated worlds. Clay only generates if the x and z coordinates are the same. SMP: When too many items are generated at once (Entity Overload / Large amount of Explosions) the client will fail to update some of them. It finally results in glowing passive TNT or all kinds of inventory items lying around, respectively. Both only vanish after a logout. SMP: Maps do not load correctly, leaving chunks missing or even entire lines missing. Attempted fix for CPU usage issue on singleplayer and multiplayer. Sometimes when you open a world you can get stuck for a short time (about 0.10 seconds). Entering and exiting the nether in SMP resets health bar, but not health. Dropped tools, once picked up, disappear after first use. Also if you die your tools can suffer a similar fate. If you shift-transfer such a dropped tool into a chest and back in your inventory, it's like a new-crafted tool without uses. Holding a map in a boat can cause the arms to be misplaced. This can be fixed by exiting the boat, and opening your inventory. If a player crashes in the nether in SMP, some times when they reconnect, they spawn on top of the Nether. The only way back is death, or using teleportation. Sometimes freezes most water into ice regardless of if its in a snow biome or not. Sometimes blocks will fail to render, creating massive holes on the ground and walls, allowing the player to see caves and dungeons under the map. Achievement display is sometimes off-panel. Updating of lighting due to Torches and other player instigated sources seems to be even worse. Underground or otherwise enclosed Rail corners can cause you to clip through wall and lose health. Minecarts colliding on the same track will pass through each other or come to a dead stop rather than pushing. One Minecart may partially pass through another on a slope, when held by a non-activated booster track. Powered Minecarts do not push other Minecarts around. Exiting a Minecart or moving from one Minecart to another will bump the original Minecart and make it move. Fire does not show up on a map item. Fire sticks around much longer on blocks it can't burn. Cobweb now acting like a solid block, player can pass through it, but he/she will get damaged. You are able to travel down through a "closed" Trapdoor/Hatch (Under certain circumstances). When boats are submerged, they do not float back to surface. ⇧ Shift+clicking to transfer items to/from chests, dispensers and storage minecarts can result in the game crashing if the items' destination would become full, or if there is no room for the new item. Can't move and can mostly only see sky and sea when server.properties "view-distance" is set above 5. Note that the default is 10. Hostile mobs sometimes spawn when using a bed even in a well lit room sealed off from outside environments, this appears to possibly be related to the lighting bug mentioned above (this can be an old bug: see File:Bed Template.png). Double doors also cause this to happen, the game somehow ignores one of the doors allowing mobs to spawn inside. Craftable maps sometimes don't display the correct name, become blank or have gaps. When crafting an item, ⇧ Shift+clicking may cause different items to be created if the elimination of resources would create a situation in which that item can be crafted. For example, having 1 stone in the top left and two in the top middle and top right, along with two sticks in the middle and bottom middle, ⇧ Shift+clicking will create a pick and a hoe. When riding a boat with a map out, the player sometimes dies for no apparent reason. Light bugs found in 1.6.2 can now occur in old generated chunks (not only in those generated in 1.6.x). When climbing a ladder in a 1x2 shaft, under certain circumstances, it is impossible to target a block opposite of the ladder. The cursor will repeatedly alternate between the wall and another block, usually the ladder. The corruption of world when running out of memory fix does not always work. When entering and leaving nether life is shown incorrectly as full. Maps may cause crashes or instability on multiplayer servers. When maps are used the server usually crashes in the same way: CPU usage goes to 100% and short after the server kicks all player and stops responding. Mushrooms can spread through walls. Lava, in SMP, anywhere near wood, even if blocked by glass, will set the wood on fire. Have observed wood catching alight that is 10 blocks away from the lava source. Maps sometimes stop updating the player position. The renderer is now capped at 100 fps while there are chunks to be generated. The excess time will be spent generating chunks instead of rendering frames. The "limit framerate" option now limits the game to 40 fps and will spend at least 10 ms per frame sleeping. The "limit framerate" option has been reset to "off" for all players, enable it again if you want it. 2 blocks deep water doesn't prevent you from fall-damage anymore. You need at least 3 blocks deep water to fall in. Fixed some block updates not updating lighting properly under some circumstances by reverting the "don’t always send block data" fix in 1.6. Fixed a major CPU load issue in the server where a very tight loop would starve all other threads. Fixed furnaces dropping/duplicating their contents when they change state from lit to unlit or back. FPS limiter limits FPS to 41 instead of 40. The fix for the CPU load issue is not working, and still starves all other threads. The item duplication bug was not actually fixed; items placed in a furnace can still be taken out of a furnace and duplicated infinitely by right-clicking (although it appears the newly duplicated item will not function). Also, bug with cloned items being picked up after death wasn't fixed too. When using a furnace and placing items into it, as soon as it's activated all items minus 1 are ejected and must be placed back in the furnace in order to use it. Lighting is not always updated when digging new holes/tunnels, placing torches or setting blocks on fire (in both nether & normal world). Tall grass can grow on dirt with no grass on it. Shift-clicking something into a full chest from inventory or from chest into full inventory crashes the client. It is now impossible to row a boat in 1 block deep water. 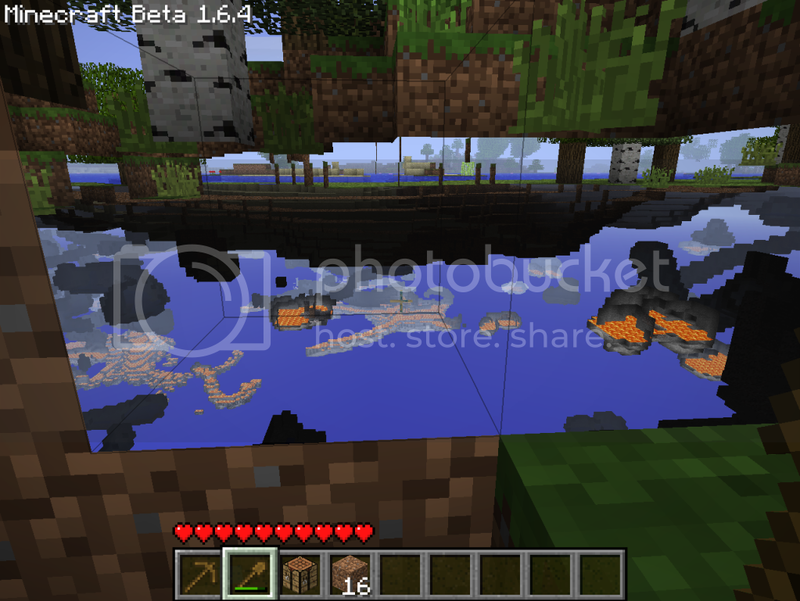 Sometimes (tested while in a boat on water, and when floating in water) while viewing a map the game will switch to a "saving chunks screen" then end on a black screen. When quitting game the "Saving Chunks" progress bar does not appear sometimes. When loading a world and standing in a cave less than 4 blocks high, the player gets some initial damage (at least the damage sound appears). "Out of memory" error. Often appears after the "blocks don't disappear" bug. Some chunks don't get dark at night (and vice versa; some chunks stay dark during the day). The textures don't load on some chunks (The blocks are present but with transparent textures). Some blocks don't disappear after being broken; it appears as if the block is still there, but can be passed through. Fixed item bug when picking up an item with a full inventory causing an infinite number of item pickup animations to play. Added Nether support to multiplayer. Added Tall Grass in certain biomes. Seeds are now found in tall grass; using a hoe on the ground no longer yields seeds. Added Dead Shrubs in Deserts. Mushrooms now spread, albeit slowly. The lighting on block icons in the inventory has been changed to appear brigher. 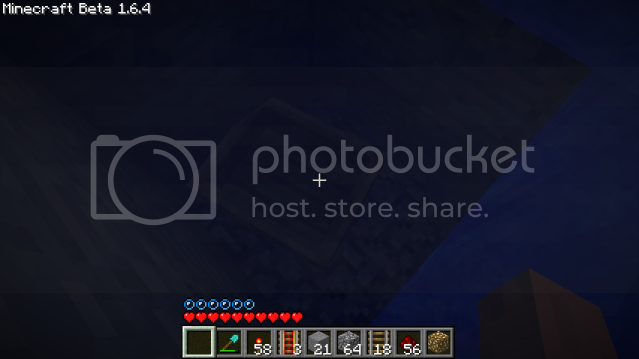 The record player now supports more than 15 different music discs; no additional music discs were added until Minecraft 1.0. Ice now regenerates regardless of whether it’s snowing or not. Blocks destroyed by other players in multiplayer now show the breaking block particle effect. Doors make sound for other players in multiplayer. Activated dispensers make sounds and trigger particles in multiplayer. Players stuck in walls will slide towards the nearest gap if there is one. ⇧ Shift+clicking while crafting makes as much as possible and moves it straight to your inventory. ⇧ Shift+clicking something in your inventory will push it directly in your hot bar and vice-versa. Temporarily disabled Advanced OpenGL due to bugs until 1.6.5. It’s no longer possible to build solid blocks on the top layer of the map. Booster tracks are now speedier to offset the loss of glitch-boosters. Fire has been severely nerfed so it spreads slower, and doesn’t spread infinitely. Compressed network traffic more aggressively. Blocks that don’t change appearance when the data changes don’t send block updates when their data changes now. Arrows shot by one player can now be picked up by other players. Minecarts and boats can go through portals, empty or occupied. Water below a layer of source blocks no longer behaves like source blocks. Fixed saving while sneaking dropping the player through the ground. Fixed player rotation not being loaded correctly when loading a saved game. Fixed the player not being able to sneak off lowered blocks like cacti. Fixed a game crash when riding a vehicle or animal into the nether. Fixed falling while riding not dealing damage to the rider. Fixed buttons and levers too close to the player being impossible to use. Fixed furnaces and dispensers not dropping their contents when destroyed. Fixed fire and lava dealing damage through wall corners. Fixed entities reaching water through wall corners. Fixed placing doors next to cacti creating half-doors. Fixed farmland taking too long to dig. Fixed tilling below some blocks being possible. Fixed tilling the underside of blocks somehow working. Fixed fences and stairs sometimes becoming invisible. Fixed fences and signs preventing grass from growing. Fixed walking on top of fences not producing step sounds. Fixed grass staying alive below stair blocks. Fixed the achievement screen not pausing the game. Fixed some screens breaking the sky tint color. Fixed fullscreen mode switching causing mouse issues and screen closes. Fixed chat messages surviving through game switches. Fixed levers being placeable on weird locations. Fixed floor levers sometimes not delivering a signal downwards. Fixed floor levers sometimes not being removed when the floor is removed. Fixed dying in the nether spawning new portals. Fixed ore density varying per quadrant from the center of the world. Fixed saplings being plantable through snow onto non-grass blocks. Fixed wooden pressure plates being mined with pickaxes. Fixed creepers retaining charge level when they can’t see their target. Fixed inventory acting weird when portaling by making the portal close all screens. Fixed dispenser graphics being one pixel off. Fixed mushrooms spawning everywhere during nights. Fixed animals only spawning near light during the night. Fixed the multiplayer join screen input field being too short. Fixed entities above the map height limit becoming invisible. Fixed loads of exploding TNT generating way too many particles, which usually crashed the game. Fixed grasscolor.png and foliagecolor.png not being read from texture packs. Fixed IPv6 addresses being parsed wrong. Fixed network packets being sent unbuffered, causing huge amounts of packets being sent. Fixed inventory icons not animating after being picked up in multiplayer. Fixed mushroom soup not leaving a bowl. Fixed wolves not following their owner if the name has different caps. Fixed the compass not pointing at the spawn location. Fixed record players spawning client-side fake records. Fixed records not playing for other players. Fixed players spawning in the wrong location and quickly lerping to the correct location. Fixed monsters not being visible for players with their difficulty set to peaceful. Fixed pigs getting hit by lightning spawning client-side zombie pigmen. Fixed bonemeal use sometimes spawning fake client-side trees. Fixed saplings sometimes spawning trees client-side. Fixed weather sometimes changing client-side. Fixed fireballs not being visible in multiplayer. Fixed ghasts’ firing animation not being visible. Fixed rain sounds not playing with fast graphics enabled. Fixed rain falling through liquids. Fixed rain falling too slowly. Fixed rain and snow being incorrectly lit. Fixed arrow physics, making them not get stuck midair when you open a door. Fixed arrows colliding with reeds, portals, and other non-solid blocks. Fixed arrows being animated really strangely in multiplayer. Fixed arrows triggering too many entity move updates in multiplayer. Fixed submerged boats rising very very fast. Fixed boats placed on snow being placed too far up. Fixed sand dropping onto boats getting stuck in a falling animation. Fixed dispensers shooting through walls. Fixed dispensers biasing later slots. Fixed fire effect on burning entities sometimes getting rendered in the wrong location. Fixed fences and wooden stairs not being flammable. Fixed fire sometimes existing mid-air as an invisible block of pain. Fixed fires being impossible to put out in multiplayer. Fixed fishing rod rendering being a bit lacking. Fixed fishing rods being stackable. Fixed water interacting strangely with glass. Fixed items in glass blocks not getting ejected properly. Fixed mining glass hiding the clouds behind the glass. Fixed minecarts next to each other causing extreme velocities. Fixed rail tiles sometimes not properly connecting to a new neighbor. When breaking a minecart the player is currently riding in, the player no longer falls through the block the track is placed on. Fixed the cracking texture being dark on the sides of grass blocks. Fixed anaglyph 3d rendering mode having severe visual bugs. Fixed the achievements screen messing up the sky color. Fixed hair and cloaks being rendered in the wrong locations on sneaking players. Fixed a bug where the player could mine without visually swinging their arm. Fixed redstone repeaters using pumpkin particles. Glowstone and Jack-o-lanterns recessed into a wall or other surface no longer have shadows cast on them by surrounding blocks when smooth lighting is enabled. Fixed running out of memory corrupting the current level. Fixed the crash screen vanishing immediately. Fixed not being able to target blocks when at x or z pos 1000. Fixed a system clock change messing up the game speed. Fixed keybindings not getting saved properly under certain conditions. Fixed stats getting saved to different files in offline mode if the caps in the player name differ from the true spelling. Extreme lag on Linux and Windows multiplayer servers; the Minecraft process uses 100% of CPU as soon as the host is logged on. The frames per second of the client dropped considerably for some users. Items from the furnace can also be duplicated by right clicking. Right clicking a Duplicated item from a furnace while the chest is open results in a crash. 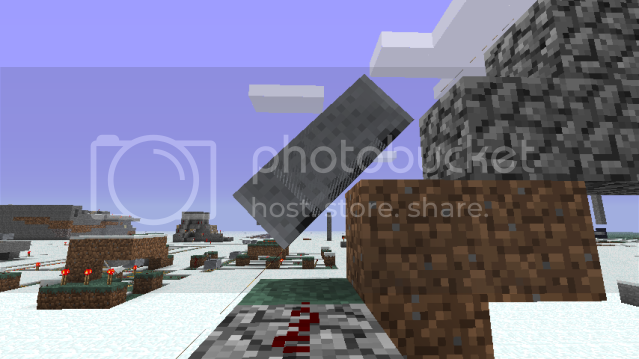 Items do not eject properly from any block, they will become buried if a block is placed over them. When pressing Q to drop a tool and re-collecting that tool, it will only last for 1 more use. ⇧ Shift+clicking from an inventory to a chest when the chest is full brings the "Saving Chunks" screen  to appear and crash. After death, any items dropped will spawn an infinite number of clone tools to the player when they attempt to pick them up. The tool-tips for Tall Grass and Dead Shrubs are missing in the Statistics menu. Tall Grass looks gray in Statistics menu due to not being filtered with grasscolor.png. Furnaces will sometimes eject all but the last item in every slot. An item bug was introduced where people could pickup items while their inventory is full. Trapdoor textures are mirrored wrongly. Walking up or down stairs is much bumpier than previously (your viewpoint bouncing vertically). Closed Trapdoors let rain fall through. Maps trying to view The Void will crash the game. Glowstone now acts similarly to glass with regards to rails, torches, ladders, doors, etc. Player orientation arrow on maps orients about 15° to the right of actual facing. Placing Rails in North/South direction, followed by placing a piece of rails on the side (and thus making a curve) results in no curve. "Outside" rain sound still plays when under a glass shelter. During rain in SMP, the server may disconnect you if you attempt to place or destroy blocks. Wolves that were tamed before this update act weird when in contact with water. Minecarts on fire can no longer be put out by nearby water. Blocks can now be placed on snow. Rain no longer goes through translucent blocks. Pumpkin and Jack-O-Lantern inventory texture now correctly faces forward. Pumpkins are no longer worn backward on the player. Game no longer crashes when rails are placed next to detector rails, or vice versa. Wolves are less common than in 1.5, but still more common than in 1.4. Blocks cannot be placed back into the output slot of furnaces, thus fixing the statistic exploit. If Minecraft detects a broken save file, it will attempt to recover the world. Many different activities will crash SMP with an "internal server error". Rain and snow now fall through Water. Minecart Tracks of all types' placement behaves unexpectedly, not properly orienting after placement. Water does not change to Ice while snowing. Levers placed on snow will have the animation like the broken lever: Media:Brokenlever.png The broken lever will point west. Aggressive mobs are unable to jump over blocks when in pursuit of the player. Thunder can be heard at the bottom of the world. Sometimes while ⇧ Shift+clicking objects into chests, the ⇧ Shift key gets stuck on. Torches are lost when attempting to place them in water. Torches simply washed away can still be collected. Pigs struck by lighting become a Zombie Pigman. Creepers golpeados por un rayo, serán electrificados y tendrán una explosión mucho más poderosa. Ability to change GUI size (Small, Normal, Large, Auto). ⇧ Shift+clicking on something in a chest will immediately move the selected item(s) into your inventory and vice-versa. Birch and Pine/Spruce trees now drop Birch and Pine/Spruce saplings, respectively. Huge performance improvements for old and slow computers. Crafting a ladder now produces 2 ladders to offset the fix of the staggered-ladder exploit. Saplings can now serve as fuel in furnaces; they have the same smelting time as Sticks. Dropped items in flowing water move faster than before. Redstone dust can be placed on snow. Wolves are more common, even in non-taiga/forest biomes. Pressing Tab ↹ will switch between input boxes. You are only 'on' a ladder (can climb it/fall slowly) if your lower half is in the ladder block, rather than any part of you. It is no longer possible to climb with a one-block gap in a ladder, or a ladder that starts at eye level. On fancy graphics, the sides of grass blocks are now biome-specific and match the shade on the top. Player movement through water has been fixed to previous speed. Wolves' pathfinding now has a better understanding of doors. They will go through doors most of the time, but will sometimes get stuck on the 3 pixel thickness of the door. The lighting on portals and ice has been fixed when using Smooth Lighting. Stairs are no longer transparent to light. On SMP, the health of wolves are now synchronized between server and client, causing wolves to only whimper when low on health, opposed to all of the time. Redstone in off state is red again. Crops hit with water now drop seeds and wheat, as opposed to just wheat. Moving minecarts will continue to move if the world is closed. The Mojang logo is the correct size when Minecraft is maximized. The exploit to make chests three or more side by side by placing a water source and placing a chest in that source has been fixed. ⇧ Shift + F2 doesn't attempt to create massive .tga screenshots, which are more than 1GB in size, anymore. Sugar cane can no longer be placed on any block that is not dirt. Advanced OpenGL is still toggle able on systems without Hardware OpenGL 2.0 Support. The counter for when weather will occur resets when a bed is used; players who often use beds seldom experience weather. Sneaking can rarely make it so you can place blocks on the block you're standing on. Repetitively putting items able to be smelted in the furnace counts as a crafting statistic. Achievements only work in SMP if you have already completed first achievement in Single Player. Achievements will sometimes disappear when you close and re-open the game and can sometimes be restored by closing and re-opening the game again. FPS counter commonly shows Chunk Updates instead of FPS. The game will crash if Detector Rails are placed beside normal rails. A crash will also occur if a normal rail is placed next to a Detector Rail that is connected to another rail. Blocks can't be placed on snow. If you change Advanced OpenGL to on and then back again, chunks that were hidden from the occlusion culling will still be hidden even when they are in your view. Jumping off a fence in SMP triggers an anti-flight kick. Rain will fall through transparent blocks including stairs, acting as if there is no block there. When hitting a grass block the destroying animation is darker on the side than the animation on top of the grass block, though only on fancy graphics. Flowing water no longer pushes empty minecarts or activated TNT that fall into it. The create new world screen's input boxes are misaligned when using small and normal GUI sizes. The Achievements screen does not pause the game. Traveling around corners in minecarts under certain circumstances crashes the game. Weather sounds don't play when fast graphics are used. Pine and birch saplings use the original sapling's particles. Resizing the window (not fullscreen) after typing in the world name and the seed, they both will be reset to "New World" and a blank seed. Mob Spawn rates seem to have increased by as much as 10 times. The burning state may remain on furnaces even though all fuel is consumed, all items able to be smelted are used, or the output-field is full. When Smooth Lighting is turned off, the middle of certain stair blocks appear black. The achievements screen turns the sky white at night. Deaths in SMP are not counted towards statistics. Powered Rails remain powered without redstone under certain circumstances. Removed the April Fools' joke. However, the locked chests are still obtainable by inventory editing or SMP /give command. They will disappear after a while. Although this has been fixed for most players, in certain cases the bed may still fail to save the default spawn point. A glitch is present where using a pickaxe on a Mac could crash the game. New Minecraft logo (no longer 3D cobblestone blocks). Added wolves that the player can tame, or kill for no loot. Added Cookies which heal the player for 0.5 hearts. Sleeping in a bed now resets your spawn position, though does not work for most users. Apparently, at the moment the spawn point unintentionally only changes if "Leave bed" is clicked and the function is limited to SMP. Sneaking while climbing will hang on to the ladder, thus being a handy cave tool. Spiders will no longer trample crops and have walking sounds removed. Cocoa Beans can be found in Dungeon chests. The new default hotkey for the inventory is E.
Added new block, Locked Chest, which was an April Fool's gag. It linked to the 'Minecraft Store', but now it has been removed. SMP servers can now have a new world seeded with an option in the Server.properties file. Lots of infrastructure for Statistics lists and Achievements have been implemented. Scale of UI may now be changed in options.txt located in the .minecraft folder. On a fresh install, modded blocks are removed from the map. This excludes modded blocks that are placed into chests. Zombies and Spiders now hurt you in all instances (previously could only hurt you if they were 1 block above your location). Client-sided slime spawn on SMP has been fixed. Arm no longer swings when you cannot place a block. Opening and closing the inventory quickly while swinging no longer removes the character 'swinging' animation, which previously made destroying blocks faster (SMP only). If a player hits himself with an arrow, any tamed wolves will attack the player. Tamed wolves whimper in SMP regardless of health. This is because client-side health was used instead of synchronizing the health level with the server's. Wolves cannot travel through doors. A small hole can be punched out near the door as they are 1x1, thus creating a "doggy-door" until their pathfinding is updated to recognize open doors as a path they can walk through. Beds do not act as the spawn point as intended, especially if it changes without reloading the save. In most instances, it is unconfirmed that the spawn point is even changed at all. Several light calculation glitches were introduced, which can be seen when destroying or placing a block near tree leaves and other translucent blocks in Fast or Fancy graphics settings, or loading a new chunk that contains overhangs. Sometimes torches do not emit light, but can be forced to by placing a light emitting torch near them. If these torches are removed, the light will not go away. In SMP, a Monster Spawner that spawns pigs will spawn client side pigs. Like other client-side glitches, they cannot be attacked and upon a re-join, will vanish. Flowing Water will push the player with more force. Breaking a block made of two slabs now drops 2 slabs. While starting a new world, players can choose the world's name and seed to generate the world from. F1 and F3 are now toggled when pressed. When F3 is toggled on, mobs display their unique entity ID numbers over their heads. In 3rd person mode, character can be visibly seen to bob side to side when you walk (only when View Bobbing is enabled). Sandstone is now found at the bottom of naturally generated sand. Mine time for Sandstone decreased. Redstone Wire will get darker the farther away it is from a source of power. Fewer passive Mobs when on harder modes. Deleting world confirmation changed slightly. When breaking double slabs (one slab placed on another) it will drop two slabs instead of one. Wood and logs don't burn forever anymore. No longer receiving Java Log error .txt file spam in the minecraft.exe folder when closing the Minecraft client program. Players can no longer use the click-release to quickly mine blocks (referred to as "click mining"). Note: Only applies to SMP. Players can no longer milk Squids. 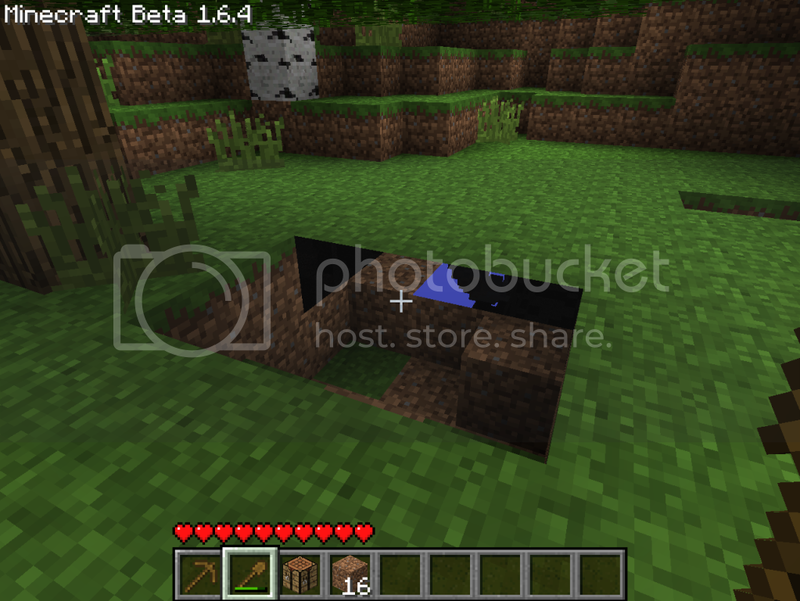 Bedrock and other blocks cannot be removed by tilling grass or dirt with a hoe and placing seeds anymore. Slimes can be killed, but split into smaller slimes regardless of weapon used. Only one split slime can be damaged, the others are 'ghost' slimes which disappear upon reconnecting. The game will occasionally crash if you enter a Nether portal while in a minecart. Wooden Slabs are best mined with pickaxe, not an axe. The particle colors for wood and sandstone slabs are gray. The particle colors for Redstone Repeaters are the same of pumpkins. Zombies and Spiders cannot hurt players unless they are above them or jumping(true in SSP only). If debug screen is toggled on in a world and you save and quit to title screen, the graph stays on the screen. Lighting bugs on transparent blocks with smooth lighting. When a player drowns or is otherwise killed near or in water, all 10 bubbles of the breath bar show up. If a redstone torch which is placed on the side of a block receives power, it will turn off permanently and must be manually reset. It will not turn back on. Redstone Repeaters may stay on when without turning off when turned on and off repeatedly for a long time. May be the blocks equivalent to a Redstone Torch burn out. Once a redstone torch is burnt out, any torch placed in that position will immediately burn out when given power. Torches will also remain burnt out forever. Creating a new world or first joining an SMP server will spawn 64 torches, 63 stacked beds, 1 unstacked bed, and Diamond tools (later fixed). Las actualizaciones pueden ser voluntarias. Links de la Comunidad añadidos. Soporte de Líneas de Comando añadidas. Ability to choose Minecraft directory location - Edit: Ability to open minecraft directory, the ability to change it, has yet not been implemented, though it was predicted. Las Skins ahora son descargables de Amazon S3 en vez de minecraft.net. Ahora el bloque de Lapis Lazuli suelta de 4 - 8 Lapis Lazuli por bloque minado, solo en modo de un jugador (Los servers de Minecraft Beta todavía no han sido afectados). El bloque de Lapis Lazuli puede hallarse al nivel de la bedrock. Los sacos de tinta han sido renombrados a "Ink Sacs". Arreglado varios bloques que actuaban muy extraño cuando se colocaban (railes, antorchas, y más). Añadida una nueva pintura que no fue añadida en la version 1.2. Reducido el spawn un poco. Arreglado muchos bugs de brillo. No hay mas fantasmas por la noche. Agregado arreglos temporales, para hacerse cargo de visibles errores de chunks. Slimes fueron re - añadios al juego con bajas probabiliades de spawn. Reeds retconned into sugar canes. They still make paper. Bones can be crafted into Bone Meal. Tools made out of wood, stone, iron, and possibly diamond have increased durability. Gold tools can remove blocks like stone and wood much more quickly than their diamond counterparts, with the same durability and restrictions as before 1.2. Mob Spawners again show a rotating model inside of what they spawn in single player. Wheat Seeds might be harvested more often when plowing grass blocks. Included the FastRender mod by Scaevolus. Screenshots can be taken using the F2 key without having to first hold down the F1 key. Iron, diamond, and coal are found in larger amounts (at least) in caves. Included PowerPC color and audio fixes by Scaevolus. Jack-O-Lantern now has correct tooltip. Sheep now visibly lose their wool when hit in SMP. Fixed the chest not opening with empty hands bug. Added a missing font file in the package build. Attempt to patch missing font file. Fixed "fancy" characters not working in the game by detaching font resources from the code. Fixed FPS drops in single player. Fixed players getting spammed with data and getting disconnected in SMP. Fixed the item dupe bug in SMP. The quote on the main menu said, "Merry X-mas!" All players wore a Christmas themed cape. All players wore a purple cape with an 11 on it to celebrate the coming year. The quote on the main menu said, "Happy New Year!" Fixed problem where game wouldn't run on Macs plus possibly other unknown fixes. Fixed rare crash on level load bug. Frame rate/performance issues not fully fixed. Disconnects from multiplayer servers due to overflow. Working server-side inventory. And as a result of that, a whole pile of bugs and issues got fixed. Tools thrown on the ground don't repair themselves anymore. Made SMP servers save chunks way less often in most cases. Chunks don’t resave if they got saved in the last 30 seconds. Moving too far away from a chest, or having it blow up, closes the inventory screen. Introduced leaf decay again. It acts differently from before. You can now throw eggs. Throwing an egg has a chance of spawning a chicken. Added super exclusive clan cloaks for Mojang Employees. ...and something else, which is even more rare (DeadMau5 skin only in use on Deadmau5's server). Tooltips in inventory - When you mouse over an item, its name appears. You can't store things in the inventory crafting fields anymore. New constant splash text on the main menu: "Finally Beta!" When looking in a double chest you can't do anything with the two bottom rows in your inventory. Players get disconnected after a short while on local Minecraft servers. Game starting problem for some people (especially Mac). Se editó esta página por última vez el 14 nov 2018 a las 02:39.